Have you ever thought about why we were given two ears but only one mouth? I truly believe that we were meant to listen more than we speak. I am always in awe when I meet people who are truly good listeners. They seem to be few and far between these days but it is a skill that we can all develop if we choose to focus and pay more attention to how we act and react. This past New Year's Eve, my hubby and I were invited to two parties and the first stop was the home of one of our dear couple friends'. There were many strangers among the group with whom we conversed with but I also got to see a woman that I hadn't seen in several months. I don't know her extremely well but we've been a part of the same social events and have e-mailed each other recently about getting together. She walked over and started chatting with myself and my hubby (whom she'd met once before). We started catching up on our holiday events and she had started asking me some specific questions about what was new in my life in certain areas. Once I began answering her, she became distracted and stopped listening. My responses were not long and were new bits of information to her. Somehow though, she kept pausing and stepping out of our conversation to go grab something for her new boyfriend (who accompanied her to the party and whom I had met for the first time), and to grab a glass of water as she ate something spicy, etc. I can't remember every single circumstance but there were a LOT of interruptions coming from someone who seemed so interested and had asked me about what I was sharing with her. It appeared as though a lot of her distractions involved making a good impression on her new boyfriend by attending to his every need. I made it a point to pay closer attention when I asked her questions and to be an even better listener because what had just happened to me was not comfortable and was quite frustrating to say the least. If you're going to ask someone a question, listen for the answer, don't just appear interested to attempt to be social. She did however, inspire today's post. One the flip side, I have known so many great listeners, one in particular always comes to mind because he has such a way of making you feel like you're the only person in the room and that nothing outside of your conversation at that time matters. I was so drawn to this quality in fact, that he is someone that I wound up dating for several years, many years before meeting my husband. Listening to others to understand what they are going through or what is on their heart makes someone feel special. It makes someone feel appreciated, heard and less alone, which many people in this world feel. 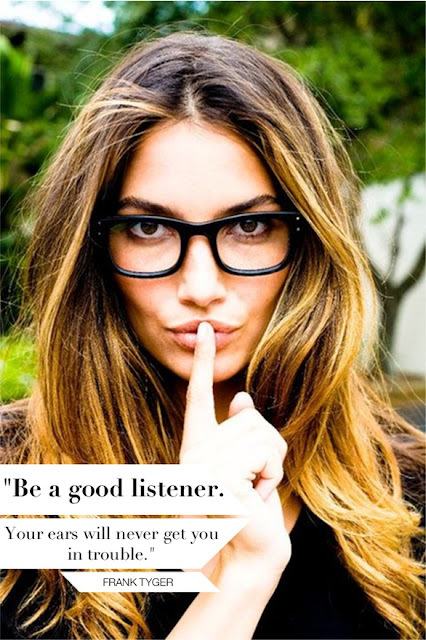 Becoming a better listener improves who you are as a person. When you are 'present' in the moment, you are not already thinking of your next response to someone's comment, or seeking out a way that you can relate to them by rifling through your mental file of your past. Many people treat conversations as a competition and are ready to fire out the next joke, comment or fact. However, being present is so important to our overall well-being and it allows us to retain more information and better assimilate information for future reference. We know by now that multi-tasking doesn't really exist. We need to be focused on one thing at a time. Have you ever talked to someone on the phone who was driving, putting away the dishes at home or worse-surfing the net while talking to you? We can always tell that they are not fully paying attention, so I'm not sure how they think they're fooling anyone. I am amazed at how some of my friends (who are good listeners) can recall certain specific information about me or something I had mentioned one time, long ago offhand. Those are the friends that I consider to be my true friends, the ones that put themselves aside for a few minutes and really listen. Don't we all want to be a better friend, partner, wife, mother? Here are some tips below that will encourage you to listen with both ears. 1. Maintain Eye Contact- This lets the speaker know that you are listening. You can incorporate acknowledgements by nodding your head too which shows that you are paying attention. There's nothing worse than talking to someone who is looking around the room, starting down to check their phone and generally appearing disinterested. Eye contact is key. 2. Don't Interrupt- As much as you want to jump in with a similar experience or mention something you heard on the news that relates, resist the urge. Interruptions can cause the person speaking to lose their train of thought. Besides, cutting people off and constantly interjecting is just plain rude. It tells the person speaking that what you have to say is more important than what they have to say. 3. Stop Fidgeting- Many people fiddle with their clothes, twirl their hair or slouch in their chair which shows boredom and disinterest (whether they realize they're doing it or not) and can actually distract the person who is speaking, whether it is a formal or casual setting. Sometimes, what someone says may not be of interest to you, especially in a long lecture but just press through and know that it will be over soon. Try to sit up straight, avoid fidgeting and instead focus on the person speaking. Remember that what you have to say might not always be interesting to everyone around you, so be gracious. 4. Repeat Their Words- To show the person speaking that you are listening, repeat what they said or comment and say something short like, 'Wow, I had no idea that Bali, Indonesia had so many beautiful places to surf'. Be sure to keep it short though so you don't distract them or wind up taking over the conversation which can be easy to do. 5. Avoid Distractions- Whether you are meeting someone for business, joining some friends for coffee or spending time together with your spouse, the most important thing to do is eliminate distractions before they arise. If you go out to dinner to catch up, make sure your cell phone is off and that your kids are left with the sitter. Set yourself up to be a better listener that will not be distracted by other people, noises, phone calls, the TV, computer and the like. None of us are without flaws and I can certainly attest to being a poor listener at times, especially when I have a lot on my 'to do' list. Everyday I strive to become a better one though, especially in my own home. It's easy to take someone close to you like a spouse for granted, especially when you may have heard the same story many times before and feel like you don't need to hear it one more time. Is there anyone in your life whom you admire because they are such great listeners? Maybe you experience people who constantly interrupt you? Does their behavior inspire you to become a better listener? I need to work on this badly. Sometimes, I can be looking at a person and hearing every word he says, but two seconds later, I can't remember a thing. A wake up call for me that hopefully sticks. This is such an important trait when being with others.